Nokia officially unveiled on Wednesday what company CEO Stephen Elop called "the first real Windows Phone," the Nokia Lumia 800 and its lower-end cousin, Lumia 710. The 800's design is very similar (some might say a carbon copy) to the critically-acclaimed MeeGo-based Nokia N9. 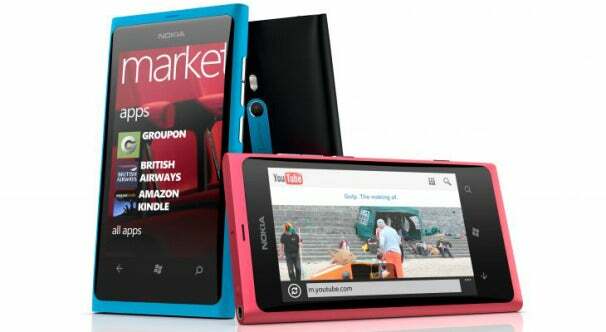 The N9 was also mourned by reviewers since it was Nokia's first and last MeeGo phone, and a device that never shipped in the U.S. Nokia said the Lumia 800 will start shipping in Europe in November for about $580. The 710 will cost about $375 and will first ship to Hong Kong, India, Russia, Singapore and Taiwan before the end of the year. Nokia plans to introduce a range of Windows Phone devices in the U.S. in early 2012, but it's not clear if the Lumia 800 and 710 would be part of the U.S. line-up. Nevertheless, since the Lumia 800 is being hailed as "the first real Windows Phone" here's a breakdown of the company's first crack at Windows Phone 7. The Lumia 800 has a 3.7-inch ClearBlack AMOLED display with 800-by-480 resolution. ClearBlack is a Nokia technology the company says makes the screen more visible outdoors. The new smartphone is packing a single-core 1.4 GHz Qualcomm Snapdragon processor, 512 MB RAM, 16GB onboard storage, 802.11 b/g/n Wi-Fi and Bluetooth 2.1 connectivity, micro-USB port, 8 megapixel camera with a f/2.2 Carl Zeiss lens and 720p video capture at 30 frames-per-second. Nokia claims the handset has up to 9.5 hours of talk time and up to 55 hours of music playback. The 800 weighs about 5 ounces and comes in Black, Cyan and Magenta. Both the 800 and the 710 are running Mango, the latest Phone 7 release that includes features such as multitasking, an improved Web browser and a Wi-Fi hotspot mode. Nokia also packed in a bunch of extras such as Nokia Drive, a free turn-by-turn directions app for more than 100 countries, Nokia Music store with MixRadio streaming, and an ESPN sports hub exclusive to Nokia Windows Phones that lets you follow news, stats, scores from your favorite sports teams. It's not clear how many of these extras will be included in Nokia's American Windows Phone line-up. The Lumia 710 has a few similar features to the 800 including a 3.7-inch with 800-by-480 resolution, although the 710's display is TFT and not AMOLED. Both devices also have the same 1.4 GHz processor and 512MB RAM. The 710 also has 8GB internal storage, 5 megapixel camera with LED flash, 802.11 b/g/n Wi-Fi and Bluetooth 2.0 connectivity, micro-USB port. The 710 has a talk time claim of up to 7 hours and up to 38 hours of music playback. The 710 weighs nearly 4.5 ounces and comes in a variety of interchangeable covers on the back including black, white, cyan, fuchsia, and yellow and black or white on the front. Connect with Ian Paul (@ianpaul ) and Today@PCWorld on Twitter for the latest tech news and analysis.